The importance of lighting goes beyond aesthetics; inadequate lighting affects mood and sense of wellbeing, compromises design, and contributes to falls and injuries. Every room should have three light sources: Overhead, task and ambient. An example includes an overhead chandelier or ceiling fixture, wall sconces or pendant lighting for ambient, and lamps for task, mood or accent lighting. But many contractors and homeowners skimp on lighting and don’t install adequate fixtures in both new construction and home remodeling projects, says Mitzi Beach, an interior designer from Wichita, Kansas. She is also the 2014 High Point Style Spotter, specializing in the baby boomer market. The biggest reason is safety. Appropriate lighting is critical for any room and for any and all ages, but especially for the 78 million baby boomers, Beach says. “At 50-plus we see 40 percent less light than we did at 20 years old. And yet, the majority of homes have not upgraded their lighting to meet the challenge of seeing better for a better and safer quality of life,” Beach adds. Many people are living in under-lit homes, either because a main overhead light was never installed or people use lamps in lieu of a bright overhead light to create ambiance. One main source isn’t sufficient, especially in kitchens and living rooms, because it creates shadows in all four corners, Beach says. Plus, there is a tendency to keep overhead lights off because they are so bright and use lamps, but that often isn’t bright enough and can lead to trips and falls. Beach says all rooms need dimmers to control glare and adjust lighting levels for differing times of day or functions. Adding a dimmer is an inexpensive, DIY project. It also helps if you have lamps that work on a switch. Another tip is to install lights that work on sensors and activate when you walk by them or wave your hand. 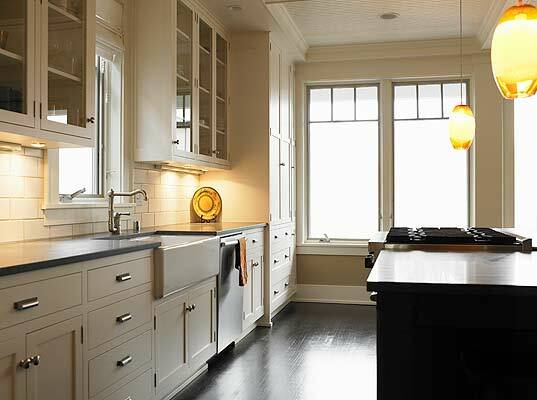 In a kitchen, there should be under-cabinet lighting , in addition to overhead lighting and accent lights like canned or recessed lights or pendants over an island or dining table, Dostal says. Track or pendant lights are options to highlight artwork, shelves or custom-made cabinetry, Dostal says. LED lighting has come a long way and has many benefits for consumers. They last longer than regular bulbs and save on energy costs. For reading purposes or computer work, Beach recommends wall sconces or lamps with a swing arm, rather than a lamp on a night stand or end table, so you can move the arm over a book, desk or laptop. Most people don’t have a dedicated spot where they work anymore, and with that comes inadequate lighting. If the computer is the brightest thing in the room and there isn’t any other complementary lighting, it’s very hard on one’s eyes, Beach says.